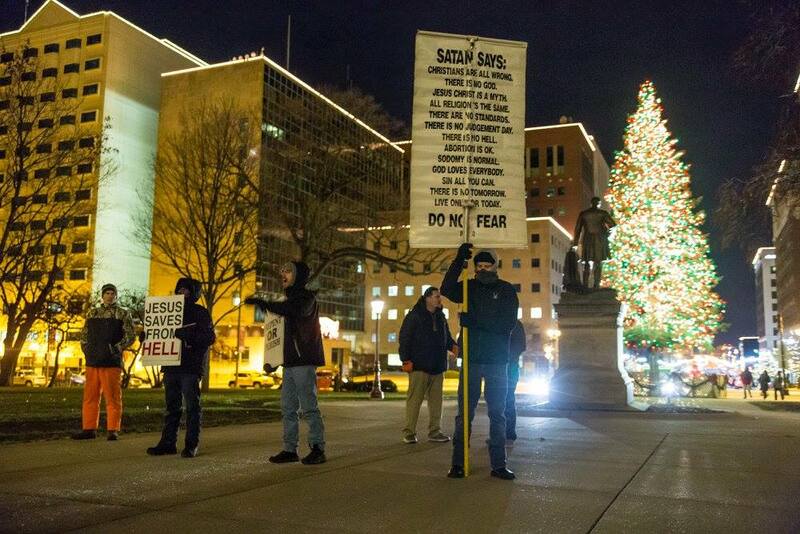 On December 19, 2015, The Satanic Temple of Detroit held a Satanic ceremony on the steps of the state Capitol in Lansing, Michigan. Only months after Pat Robertson took to the air on The 700 Club to warn that The Satanic Temple’s activities portended imminent Satanic ritual activity on “the statehouse lawn of some state,” the Detroit chapter of The Satanic Temple received approval to perform a Satanic ceremony on the Michigan statehouse lawn. The ceremony took place on December 19, 2016 and was a historic event - marking the first ever Satanic ceremony performed at a state capitol. The event was a response to a live nativity performance sponsored by the Ted Cruz campaign held the same week, a expression of Christian pride which could have easily been a private display at any of the innumerable local churches rather than state Capitol grounds. The Satanic ceremony was a public declaration of Satanic ideology inspired by political rallies where divisions between the religious and the civic often blur. Video by Matt Anderson. Photos by Bruno Vanzieleghem. Read a full transcript of the speech.